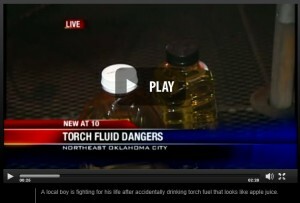 A local boy is fighting for his life after accidentally drinking torch fuel that looks like apple juice. Click here to watch the story on KOCO. Carr & Carr Attorneys has experience helping families of children who have been injured or killed due to torch fuel oil accidents. Contact a compassionate, knowledgeable attorney today to see if we can help you. Call 877-392-4878 to speak with an attorney right now, or email us and we will call or email you back. We will travel anywhere in the United States that we need to, in order to help you with this. Because of the number of families we have represented who have been devastated by children accidentally swallowing torch fuel, we are passionate about helping families. The information found on this website has been prepared for information purposes only; the information should not be construed as legal advice nor does the information imply any guarantee as to the results of future litigation. You should not act or rely upon this information without seeking formal professional counsel specific about your case. Carr & Carr Attorneys' offer to provide a free case evaluation is not intended to create an attorney-client relationship between Carr & Carr Attorneys and you. Carr & Carr Attorneys at Law. All Rights Reserved © 2019.